anomia [uh-No-mee-uh] – noun – 1) A problem with word finding or recall. 2) Chaos. 3) The game where common knowledge becomes uncommonly fun! 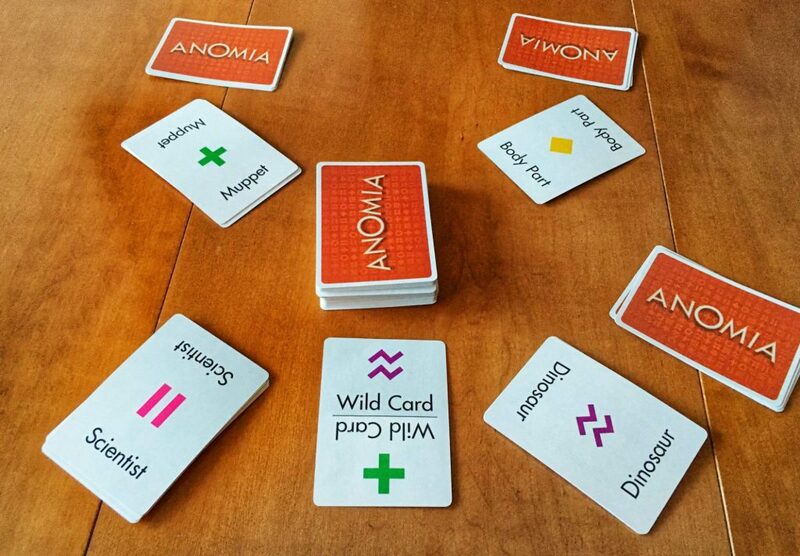 Anomia is a speed word game in which players are trying to name something in the category on their opponent’s card. Anomia Kids works in the same way, but it has been simplified for children. If you are already familiar with how Anomia plays, you can skip ahead to the “What’s New in Anomia Kids?” section below. If not, continue reading to learn how the games work. 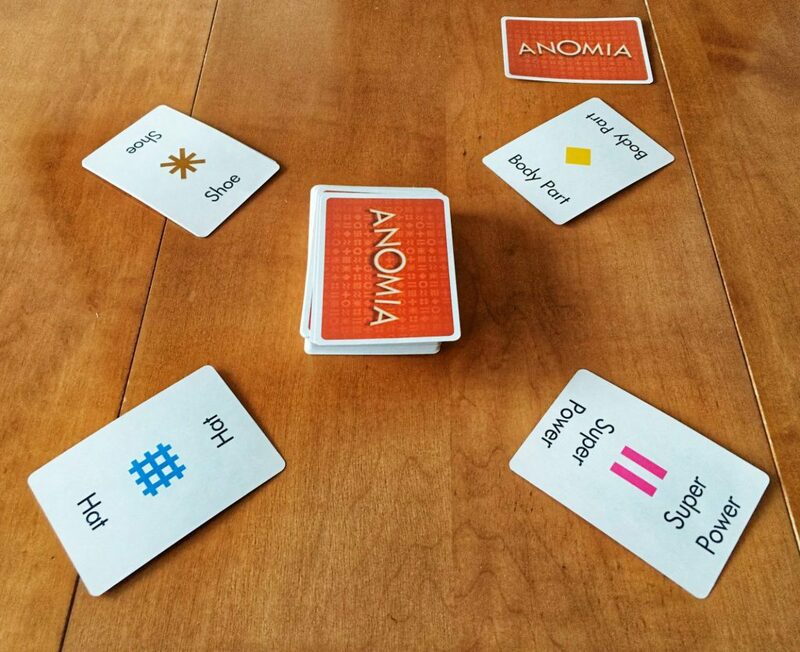 A game of Anomia is easy to set up: take one of the coloured decks of cards (the Draw Pile) and place it in the centre of the table within reach of all players. A turn will play almost as easily. On their turn, a player flips over a card from the Draw Pile and places it in front of them. Players only ever have a single card faceup in front of them (their Play Pile) so each new card drawn on future turns is added to their deck of cards. Play continues this way, in clockwise order, until the symbols on two cards match. This is where the fun and shouting begin! When two players have symbols that match, these players must now Face-Off in a race to be the first to name something in the category on their opponent’s card. Yes, the Face-Off will be as dramatic as the movie. The player who finishes blurting out their answer first wins the Face-Off. This is an important point because under pressure you may find yourself wanting to give the fanciest, longest answers. Don’t. You will lose if you give “Harry Potter and the Philosopher’s Stone” as a book title when your opponent only needs to name an animal. Trust me, this has happened to me more than once. The “European Country” and “Body Part” players must Face-Off and try to beat the other to a correct answer. The winner of the Face-Off takes their opponent’s card from the top of the Play Pile and places it facedown to the side. The player who has collected the most cards in their facedown pile at the end of the game wins. The player in the upper right corner was first to name a European Country. They won the Face-Off and added their opponent’s card to their score pile. 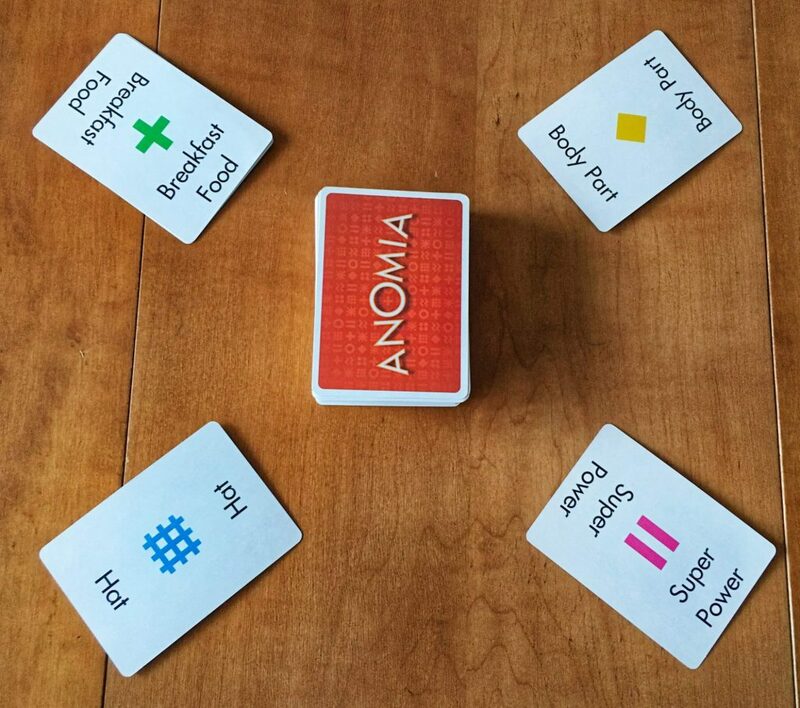 While playing Anomia, you must always be in a state of total awareness (zanshin, not unagi) because when a card is removed from a Play Pile, the card underneath is revealed and considered to be in play. This could then trigger another Face-Off somewhere around the table. If you aren’t careful, you might find you lost a Face-Off you didn’t even know about. All Face-Offs are resolved one at a time until there are no more matching symbols. Each player continues to take turns, drawing cards and resolving Face-Offs until the deck is depleted. 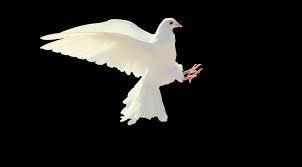 Wild Cards show two different symbols. When one is drawn the two symbols on the card are considered matching for the purposes of a Face-Off. Only one Wild Card is ever in play at a time. This Wild Card is in play so the “Muppet” and “Dinosaur” players match. Now they must throw down in a Face-Off. What’s New in Anomia Kids? 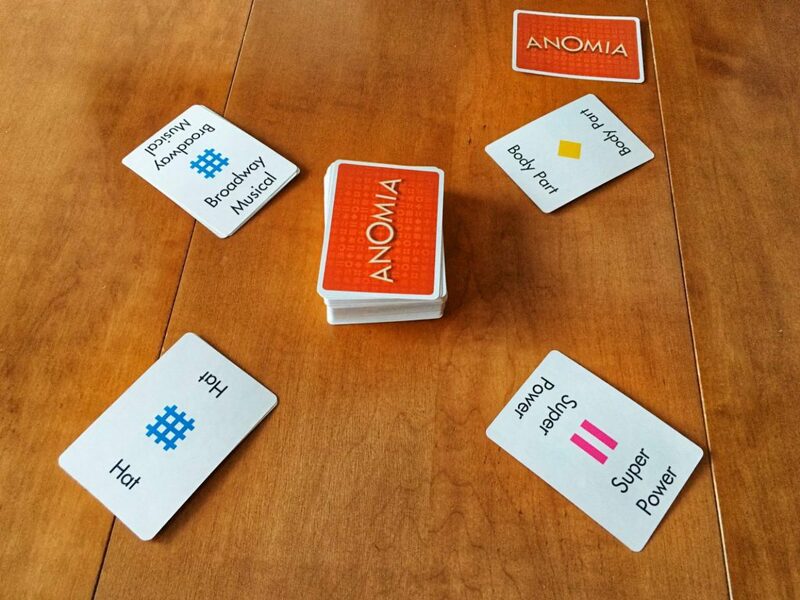 Anomia Kids plays the same as Anomia: players draw cards until two symbols match and there is a Face-Off. However, the cards are a little different. Rather than symbols and words, the cards in Anomia Kids have symbols and images. The cards in Anomia Kids have no words, making them perfect for younger players. Instead of calling out a word in the category on your opponent’s card during a Face-Off, a player calls out a word that begins with the same sound as their opponent’s image. In all other ways, Anomia and Anomia Kids play the same. 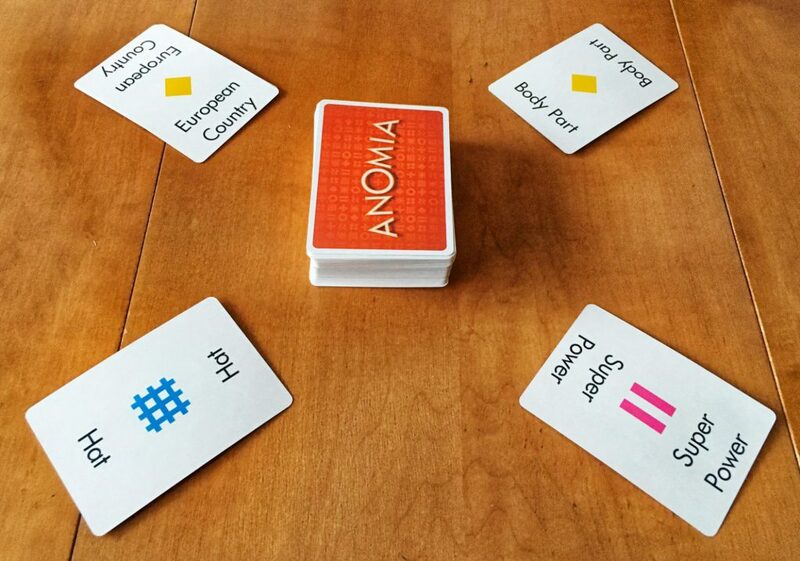 Anomia is one of my favourite party games because it encompasses everything I want from the genre; it’s loud, it’s frenetic, it’s fun, and it’s hilarious. It’s also inexplicably difficult to master. I’ve played the game many times and I still have moments where I stare at my opponent’s card during a Face-Off, trying to quickly think of a type of bean and come up with nothing but bumbling sounds. There is a reason this game made Meeple Mountain’s 2016 Gift Giving Guide and why it was also among our chosen Games to Buy at Target (and other mass market stores). Since I’ve always been a fan of Anomia, I jumped on the opportunity to review Anomia Kids, especially when I could see it working really well in the classroom. I’ve found that the game, without any rule modifications, works best with kids between 8 and 12 years old. 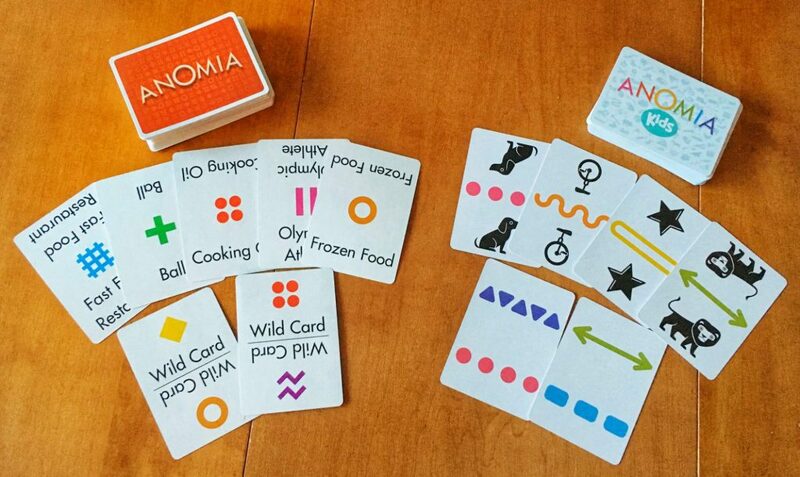 For kiddos unfamiliar with Anomia, I usually start my teach of the game by telling them to simply call out the image they see on their opponent’s card when the symbols match. This helps familiarize them with the flow of the game. It also gets them out of the habit of looking at their own card’s image instead of their opponent’s (something that I know Anomia players are all too familiar with). After a few turns, I introduce the real rules. Then, only once they feel comfortable with the gameplay, do I introduce the Wild Cards. The box suggests Anomia Kids can be played with children ages 5 and up. In general, this feels like a bit of a stretch, especially without any modifications. For younger children, I’ve found they have an easier time calling out the image they see or naming the starting sound of it during a Face-Off. I’ve also taken these modifications and used them with my second language classes as a way of practicing their sounds and vocabulary. As an adult, I had a significant advantage when I played against the kids using Anomia Kids’ regular rules. In the future, I may adjust my rules by adding a countdown for myself whenever I’m involved in a Face-Off. To be quite honest though, I much preferred watching the kids teach, laugh, and play the game with each other than when I was playing with them. The Anomia system works wonderfully as party game. 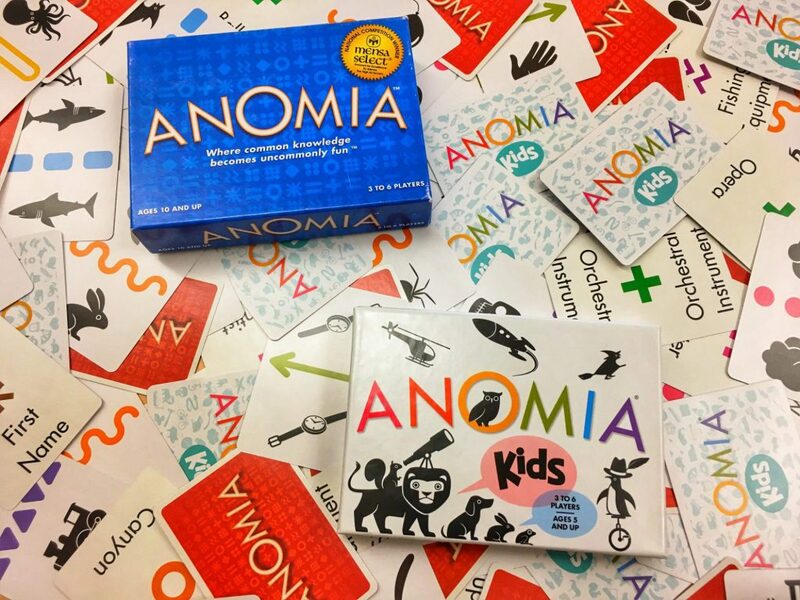 Whether you choose to play Anomia or Anomia Kids, you can be sure there will be a lot of laughs around your gaming table. Previous postHare and Tortoise Review – Hare today… still here tomorrow!